Staff Attorney Darren Jones is a member of HSLDA’s litigation team, which helps homeschool families who are facing legal challenges. He and his wife homeschool. Although Gwen Peregrina (names changed to protect privacy) started homeschooling her special needs son in October, it wasn’t until January 2013 that she won legal recognition of her homeschool program. At the beginning of the school year, Gwen Peregrina’s son Sam was not receiving the attention he needed in his 11th grade special needs classes. Since Peregrina’s repeated discussions with the school about Sam’s IEP (individualized education plan) were unproductive, she began investigating homeschooling as an alternative. Despite the IEP team forcefully telling her that homeschooling wasn’t an option, Peregrina withdrew her son from public school in October 2012 and filed a private school affidavit, one of the legal options to homeschool in California. In December, a truant officer visited the Peregrina household and then sent Gwen a summons for her son’s alleged truancy. Peregrina contacted Homeschool Association of California, which referred her to Home School Legal Defense Association for legal assistance. HSLDA’s local counsel Mary Schofield immediately called the truant officer, who stated that some school staff had expressed doubts that Peregrina could successfully homeschool Sam. Attorney Schofield explained that Sam was not truant because he was attending a homeschool in full compliance with California homeschool law. Attorney Schofield also emphasized that Peregrina had access to numerous resources on homeschooling special needs children. Five minutes later, the truant officer called back and explained that the court hearing had been changed to a review by the school, commonly called a SARB. But after attorney Schofield followed up the conversation with a letter again reiterating the Peregrinas’ right to homeschool, the school then canceled the scheduled SARB. HSLDA doesn’t believe that its mission, to protect the rights of parents to direct the education of their children, excludes any children, especially children with learning disabilities or special needs. 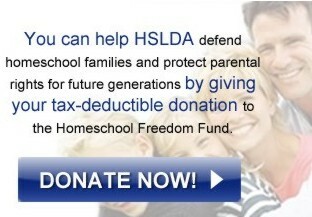 Your membership with HSLDA makes our defense of homeschooling possible. If you’re not yet a member with us, please consider joining today.